MyPlasticHeart is one of the coolest little shops in all of NYC if you’re a popart and/or vinyl toy fan. They have a tons of excellent exclusives, colorways, and one of a kinds they’re bring to The Block, but equally they’ve been doing an awesome thing on their blog of keeping up with the exclusives and signings of other folks on The Block at NYCC. So go check that out and take notes. DK publishes cool books, here’s a link to a graphic detailing their booth events. 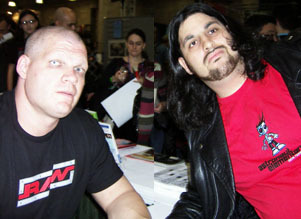 From at least my records, there was no presence in 2008, so we skip to 2009, where So Cal Val, Jackie Gayda, Christopher Daniels, James Storm, Jerry Lawler and Dawn Marie were in attendance. In 2010, the only wrestler I personally encountered was Lawler. 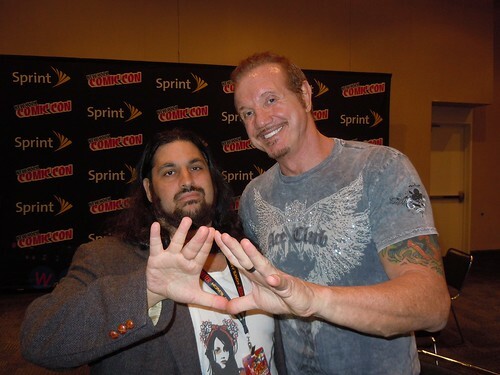 Last year (2011) Raven had a table and I met “Diamond” Dallas Page. Well this year there’s a whole slew of wrestlers appearing. Booker T. in promotion of his book From Prison To Promise. Big Van Vader, Hacksaw Jim Duggan, Tito Santana, Greg “The Hammer” Valentine, Angelina Love, Brutus Beefake, The Bella Twins, Robbie E., Kelly Kelly and much more. Some of the best parts of walking the show floor at NYCC on top of video game displays, toy showoffs and previews are interesting interactions of the social viral/meme/weirdness kind. Over at DC they’ll be a green screen photo-op where you can strike your most evil pose alongside Bane, The Joker, Lex Luthor and more and then get a special printed image of your cover to take home. Square Enix might have the craziest thing in marketing for TOMB RAIDER. It’s called thed the Tomb Raider Archery Experience and here are details from the official press release. Each participant will let three arrows fly at their own individual TOMB RAIDER themed shooting target which they can then take as a memory of the event. Those lucky archers who hit a bull-eye will receive a limited edition TOMB RAIDER lithograph. The Archery Experience is being supervised by the New Jersey School of Archery. Madefire is one of the coolest digital platforms going right now. All free comics in a new digital design program from the mind of Liam Sharp. There are comics on the application from the likes of Dave Gibbons, Gary Erskine, Jimmy Broxton, Angus McKie, Robbie Morrison, Dpug Braithwaite, and more. It’s pretty awesome, but as much as I respect the new digital revolution I will only love print. Luckily Madefire is bringing some print exclusives to the con in the Madefire Sketchbook 2012 and the MONO novella: Prospero Rising, a 150 page prequel to the first Mono comic with Gary Gianni art! One of the more exciting new booths at Comic Con will be Spoke Art. This awesome SF Art Gallery has had showed advertised in Juxtapoz that always make me wish I had a private plane. At the booth they’ll have their upcoming show, their annual tribute to Wes Anderson films. Plus prints and more, but I’m just excited about the idea of getting to finally visit Spoke Art by taking a subway instead of getting on a plane. There are going to be lots of indie comics debuting at the show, but one of the ones which has made some leeway in marketing and promotion that caught my eye is Tara Normal. It looks really quality and as I’ve said above, digital is awesome, but I LOVE print. If you look around the net you can find schedules for Marvel, DC, Dark Horse and more. Take notes, notes, notes, also notes. I am starting to feel like I could be bombarding people with too much information here. It’s a good place to end this with some perspective. 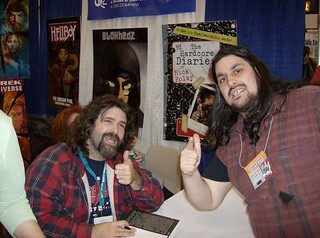 I decided to read my recaps from 2006-2011 of my expereinces at NYCC. Each year was different, each year was exciting. Each year was also exhausting and worth it. Yet each year it also felt like the first time. Everything I knew went out the window except basics. My final advice to is simple, HAVE FUN!